What Makes People Trust Online Reviews? Online reviews have undoubtedly revolutionized the way buyers and sellers interact in the market place. In theory, online reviews should be helpful to consumers. They should make online browsing and shopping easy, and they should foster a better-informed marketplace where consumers feel like they can trust these reviews before making purchasing decisions. In reality, that’s not always the case. Recent studies from researchers at Yale, Dartmouth, and USC confirmed that sometimes online reviews cannot be trusted. In their discovery, they found that some hotel owners post fake reviews to boost their ratings, and, even worse, they post negative reviews on their competitors pages. 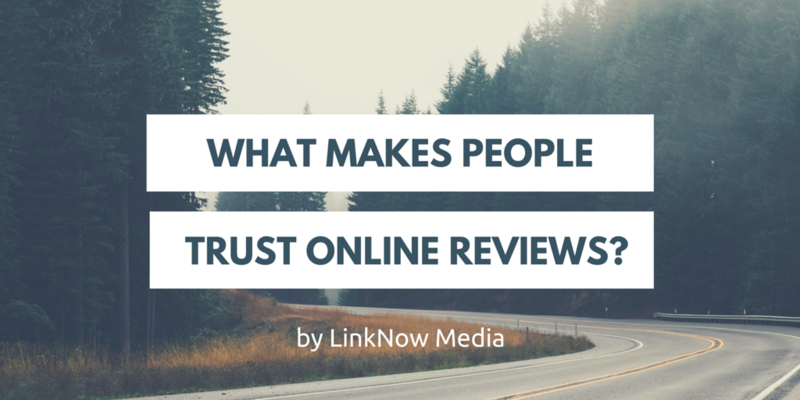 The question is, do consumers trust online reviews? How do they differentiate an honest review from a fake review? There are three main factors consumers use to determine whether or not they can trust an online review. Online schemers usually want to post negative reviews in a quick, easy, anonymous fashion. One way consumer look to see if a review is real is by measuring the level of difficulty for posting a review on that particular review website. Consumers who want to leave a review on Expedia, for example, first need to have made a hotel booking through the website. Hence, a hotel looking to inflate its rating or malign a competitor would have to incur the cost of paying for a hotel through the site. This acts as a deterrent towards fake and/or spammy reviews, and it makes Expedia’s audience more likely to trust the reviews that they see. Don’t get us wrong, some online schemers may be willing to go that extra mile, but for the most part, they will turn to another platform that makes it easier for them to do so. As another example, TripAdvisor only requires a login name and email – something anyone can provide fake credentials for; it doesn’t take time at all, and it doesn’t cost money. Some reviewing platforms, especially the ones that link to social media, will eliminate anonymity, making it a requirement that the review links to a particular profile or account. Anonymity is a online schemers best friend because unless you are posting a real, honest review, you probably can’t back up your review with actual evidence. Most people don’t want to risk potentially getting exposed for making a phony statement anywhere online. Consequently, when consumers encounter online reviews attached to real people behind them, they feel more comfortable trusting them. By no means are we justifying fake reviews, but the reality is that some companies have more to gain than others by posting them. For example, for a small growing business, acquiring tons of reviews (fake or not) might significantly drive up revenue and help knock down the competition. When faced with an oversaturated market, many companies will all too readily set aside their moral hesitations and decide it’s worth the risk. Knowing this practice is so common makes many consumers weary of small businesses reviews, especially when there are only a few to go off of. Did the company post all the positive ones? Did a competitor post the negative ones? When your business can make it or break it because of reviews, consumer tend to be quite skeptical. Conversely, big chains like Pizza Hut or McDonald’s don’t really need online reviews because they already have a massive following. No intelligent consumer is going to think that a competing company is out there trying to take down McDonald’s one negative review at a time on Yelp. Consequently, most consumers are going to believe a negative review they see online. And the positive reviews? Well if they have made it this far, it’s probably not without a ton of good reviews along the way. They simply don’t have much to gain by adding a few more fake ones. Most consumers already know what to expect with their brand, and an extra positive review isn’t going to drastically change anyones expectations. Keeping in mine factors that can add or take away from trust is important when setting up your own customer review process, as well as when you’re browsing the competition online. Ultimately, it will be up to the individual reader to decide whether they believe them or not, but you can at least make the process feel as authentic and trustworthy as possible.